Q: Who is a prime candidate for a Total Contact Cast? Patients being treated for diabetic foot ulcers / Charcot neuroarthropathy / and post-operative surgical site protection. Q: Who is not a good candidate for a Total Contact Cast? Q: What is the function of a Total Contact Cast? Total Contact Cast function is to minimize ground reactive pressures and shear friction stresses through the intimate contact with the forefoot, arch, heel, achilles tendon, and cone of the lower leg. Total Contact Cast will also help eliminate the propulsive phase of gait, while shortening the stride length. A Total Contact Cast also allows for healing while ambulating and will enforce patient compliance. Q: Indications for a Total Contact Cast? Non-infected patient, have adequate blood supply to heal (abi > 0.7) ulcer must be a Wagner grade I or grade II. Q: Will a Total Contact Cast work with hyperbaric oxygen (HBO) therapy? Yes, a Total Contact Cast is a great compliment to HBO therapy. * a Total Contact Cast can not go into a chamber for at least 24 hours after casting application this helps to ensure the Total Contact Cast is fully cured. It is recommended for the patient to conduct HBO therapy and then change the cast. Q: Best patient position for applying a Total Contact Cast? prone position, or having the patient sit on the table. Q: When casting a Total Contact Cast how high should the cast go up the leg? The cast should be casted to the widest point on the calf. Q: When should a Total Contact Cast be changed? The first change should occur within 2-3 days after first application. It is recommended to change the cast weekly thereafter, unless there are clinical signs that require more weekly changes. During the post-healing phase the patient should wear a cast for 1 -2 weeks to ensure proper skin healing. Q: Is swelling in the patient typical? 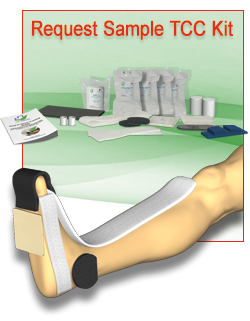 The Total Contact Cast helps control edema. As the patient walks in the Total Contact Cast – intermittent pressure on the calf help reduce swelling. In active patients some swelling will occur above the cast. The patient should walk less and elevate their cast up to reduce edema when seated. Q: Can a Total Contact Cast get wet? No a Total Contact Cast should not get wet it must stay dry at all times. If the patient does get the Total Contact Cast wet it will need to be changed. However the patient can purchase shower guards to help prevent the Total Contact Cast from getting wet. Q: What dressings for the ulcer can I use? 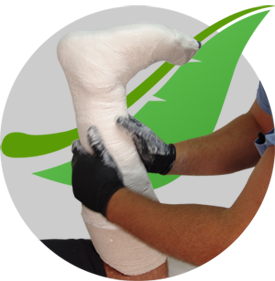 Every Total Contact Cast kit comes with a sterile polyurethane foam dressing. This dressing is highly absorbent. You can use any appropriate dressing of your choice such as silvers, grafts, hydrocollaids. Q: What complications could arise from a Total Contact Cast? Most complications arise from not casting the patient at 90 degree angle or the cast was not changed frequently enough which could allow positing in the cast. Common complications from this include skin irritation, rub, or even a new wound. It is important to follow protocol and proper casting application for a Total Contact Cast. Q: Can I receive support at my clinic for proper casting a Total Contact Cast? Yes, we offer hands on training free of charge at your clinic. We will provide samples for hands on training workshops. Yes, a Total Contact Cast is the gold standard assisting in the healing process for active diabetic/ neuropathic ulcerations and Charcot neuroarthropathy. It achieves its goal by providing weight (pressure) redistribution and friction/shear control. There has been numerous randomized controlled clinical studies that have proven a Total Contact Cast helps heal a diabetic foot ulcer in a mean time of 35-52 days for 85 -95% of patients. Q: Is a Total Contact Cast reimbursed by medicare? *amount represents medicare's national average fee schedule for these services. Medicare payment is based on 80 percent of the fee schedule amount. The patient (or secondary insurer) is responsible for the remaining 20 percent. Each insurer's specific coverage policies apply, if available.